Most of the visitors to RF Cafe are either engineers, technicians, or hobbyists who deal with watts in terms of electrical power. 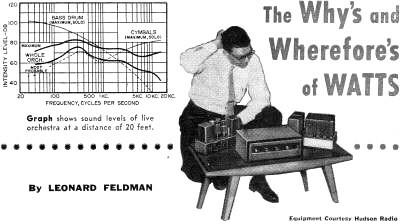 This article from the January 1957 edition of Popular Science deals primarily with watts in terms of acoustic power, but it also addresses how obtaining acoustic watts relates to electrical watts. 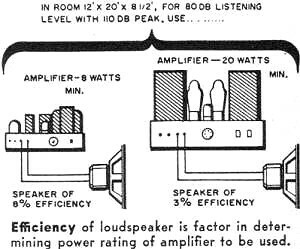 Audiophiles will appreciate the table of speaker watts needed based on your room volume as well as rules of thumb for selecting the amplifier power required to deliver that sound effectively. 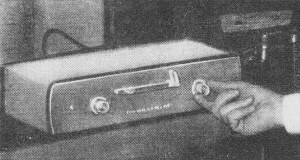 "Leading authorities maintain that the minimum acceptable power-handling capacity of a hi-fi amplifier shall be at least 25 watts." "Our research shows that the purchase of an amplifier having a power rating of over 10 watts is a waste of money." "A leading speaker manufacturer has recommended that power amplifiers for use with his speaker should be rated at 30 watts or better." 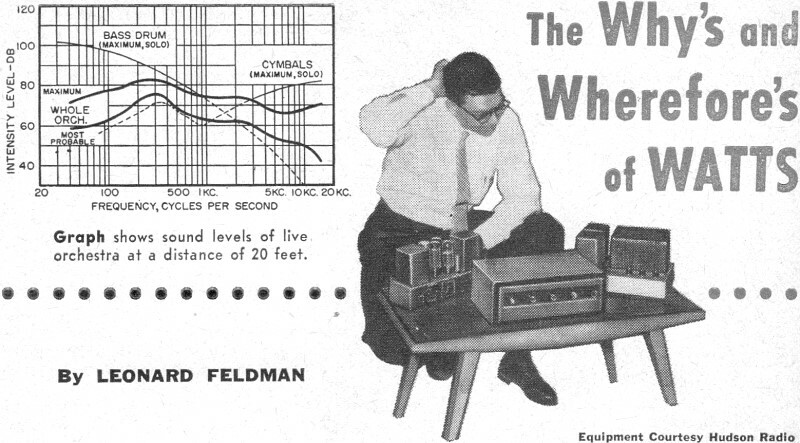 "Five watts of audio fed to an 'efficient' loudspeaker is more than the human ear can stand." If you're trying to decide which high-fidelity amplifier to buy, you've probably run across conflicting comments like those above. But before you can hope to find the amplifier that best suits your needs, you should know what this "power" and "watts" talk is all about. All the sound we hear, whether natural or reproduced, is caused by a movement of air. High-pitched sounds mean that the air is vibrating at a fast rate. Low-pitched sounds are caused by air moving at a slower rate. It takes power to move this air, just as surely as it takes power to move an automobile. The more power you apply to the driveshaft of a car, the faster it will accelerate. Similarly, the harder you push the air in making sound, the louder will be the sensation to the listener. DBs and Power. The decibel or "db" is used as a measure of sound and power because it indicates the way our ears behave when subjected to sound vibrations, or moving air. When you double the power applied to move the air in making a given sound, the sound doesn't seem twice as loud, but only slightly louder. We call this a change of 3 db. On the other hand, 10 db represents a power change of 10 to 1. In other words, actual power change, measured in watts, (just like the light-giving power of an electric lamp), is much greater than the equivalent change in decibels. The decibel method of measurement more nearly approximates the way our hearing system responds to changes in sound intensity. How to estimate your power amplifier requirements. Table above shows acoustic wattage required for various listening levels in different-sized rooms. 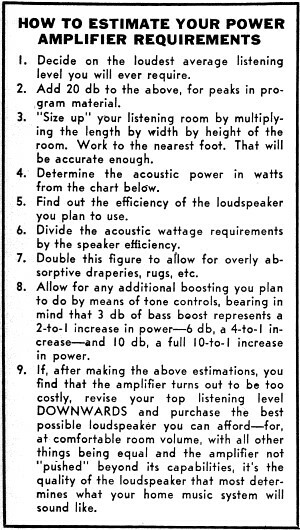 This table, used in conjunction with instructions listed above, will help you choose correct amplifier for your hi-fi. Boosting bass, even slightly, may require double the power-handling capacity of the amplifier. This little known -but important - fact should be considered when you choose an amplifier for a hi-fi system. Efficiency of loudspeaker is factor in determining power rating of amplifier to be used. 1. How much power is there behind real live music? 2. How loudly would you like music played in your living room? 4. What speaker are you planning to use with the system? 6. How large is your listening area and how is it furnished? Listening Power. Before we even tackle the first question, there's an important point that needs clearing up. The top rating of an amplifier does not necessarily indicate how it will sound at lower levels. Take a good-quality 20-watt amplifier and place it alongside a 10-watt amplifier. Send in just enough signal to develop, say, 1/2 watt-and it is unlikely that you will hear any difference between the two. The difference only shows when a very loud sound of 15-watts power must be fed to the speaker. That's when the first amplifier will handle it, but the second one will overload and cause annoying distortion. A good analogy is that of a 100- and a 200-horsepower automobile creeping along in metropolitan traffic. Since neither car can be "opened up" to its full power, both travel neck and neck, performing equally well. 1. Decide on the loudest average listening level you will ever require. 2. Add 20 db to the above, for peaks in program material. 3. "Size up" your listening room by multiplying the length by width by height of the room. Work to the nearest foot. That will be accurate enough. 4. Determine the acoustic power in watts from the chart below. 5. Find out the efficiency of the loudspeaker you plan to use. 6. Divide the acoustic wattage requirements by the speaker efficiency. 7. Double this figure to aflow for overly absorptive draperies, rugs, etc. 8. Allow for any additional boosting you plan to do by means of tone controls, bearing in mind that 3 db of bass boost represents a 2-to-1 increase in power - 6 db, a 4-to-1 increase - and 10 db, a full 10-to-1 increase in power. 9. If, after making the above estimations, you find that the amplifier turns out to be too costly, revise your top listening level DOWNWARDS and purchase the best possible loudspeaker you can afford - for, at comfortable room volume, with all other things being equal and the amplifier not "pushed" beyond its capabilities, it's the quality of the loudspeaker that most determines what your home music system will sound like. How Loud Is Music? The "quietest" sound anyone can hear is measured at "0 db." The loudest sound anyone can hear before it actually becomes harmful is about, 120 db louder than the softest sound. Anything we call "sound" - including music - falls somewhere in between those two extremes. Now, if we had a simple way of relating watts of amplifier power to decibels, we would know how much power would be needed for the amplifier. But - we have to consider the second and third factors. Home vs. Concert Hall. Since the purpose of an amplifier and speaker system is to "push some air around," the question naturally arises, "How much air?" Even traveling at the same speed, a motor scooter could never haul the load of a two-ton truck. Similarly, a little one-watt amplifier might make a lot of noise come out of a loudspeaker (if both you and the speaker are in a coat closet), but you'd hardly even hear such a system if it were installed in Carnegie Hall. The truth is, when playing records, you're not in Carnegie Hall but in your living room. So we've got to determine just how much air has to be pushed around in that room and how hard it must be pushed to satisfy your musical tastes. All of this is not meant to imply that you can't duplicate the concert hall level of 80 db or even 100 db in your living room. All we're saying is that you will most likely settle for a comfortable 60 db with the possibility of occasional 80-db peaks. In any case, that's something you must decide for yourself. Having made up your mind whether to go for full concert hall volume or not, and knowing the size of your listening area, you can determine from the table on page 50 just how many acoustic watts of power you'll need to fill the room with that much sound. Let's work out a sample based on an average living room which measures 12' x 20' and has an 8'2" ceiling. The volume of such a room is just under 2000 cubic feet (width x height x depth). Suppose, despite our warnings, you decide that at some time you will want to "crank the system wide open" and really duplicate concert hall volume, or go for a glorious 80 db on average music, with possible 100-db peaks on the cymbal crashes. Consulting the chart, you find that you need a mere .31 acoustic watt (less than 1/3 watt) to do the job. Seems hardly necessary to invest in a power amplifier at all, does it? Actually, we've been neglecting the biggest unknown of all, the loudspeaker. Furthermore, not all loudspeakers have the same efficiency. They vary from "highly efficient" units of 10% to 20% to all-time lows of considerably less than 1%. If you've been following the latest advertisements put out by loudspeaker manufacturers, you probably realize that there's something of a "factional war" going on between the proponents of the "high" efficiency units and the relatively "low" efficiency units. Far be it from us to get into the squabble. All we want to do is point out the fact that a speaker having an efficiency of 1% will require 100 times as much amplifier power for a given acoustic power - or that, in our example, to get .31 acoustic watt means hooking up such a speaker to an amplifier able to supply 31 watts to the speaker. A speaker having an efficiency of 10% will need 10 times as many amplifier watts for a given number of acoustic watts or, again using our example, 3.2 watts supplied by the amplifier are all that will be needed to meet the same acoustic requirements. It should now be apparent that unless you have a fairly good idea of the efficiency of the loudspeaker you propose to buy, you cannot even attempt to estimate your amplifier requirements with any reasonable degree of accuracy. This is the single factor. that we can't put a number on. 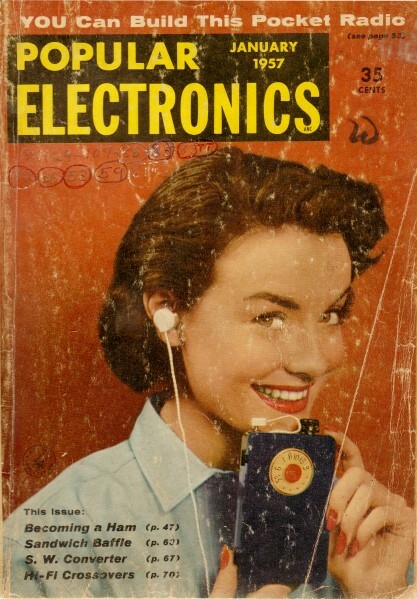 Only the speaker manufacturer involved can do that for you - and more and more of them, realizing the misunderstanding that exists on this one point, are becoming less and less reluctant to publish this information as a regular part of their sales specifications. It's really nothing to be ashamed of! Most of us have known for years that an automobile engine only converts about 6% of the energy contained in a gallon of gas into usable power, but we still buy millions of cars each year! Multiple Speaker Systems. If you feel that eventually a second or even a third loudspeaker installation in another room or two is good future planning, the formula is simple as can be. If the second room is about like the first and you ever plan to have both speakers going at the same time, you'll need double the power of your first calculations. Important point: many loudspeaker installations are equipped with so-called level controls, or pads, with which it is possible to turn off the sound coming from a given speaker. Just because the sound is turned off in this manner doesn't mean you're using less power. The same amount of power is being absorbed at the speaker terminals. I It's simply all used up as heat in the wire-wound resistor which makes up the speaker-control. The only way an amplifier can be used for two speakers and still require the power calculated for only one is if you actually switch the appropriate speaker in and out, effectively disconnecting one terminal of each speaker not in use. Tone Controls Use Power. If your listening room, your personal tastes, or any of countless other factors make you want to add a little bass boost by means of the tone controls on your amplifier, you'd better take that fact into account before you go shopping for watts. Remember, a bass boost of only 3 db requires double the power-handling capacity at certain frequencies than would be the case if all your tone controls were set for flat response! however, has instruments at both extremes as well as in the "middle", and you'll notice from our graph that all the frequencies need pretty much the same power for a given volume of sound. Therefore, it's important to know not just that a given amplifier produces a maximum undistorted power of "5 watts" or "10 watts" or even "50 watts," but that it can produce that much power at all the frequencies involved in musical reproduction, or at least from 30 cps to 15,000 cps. If this were not the case, certain instruments would be clear and undistorted at maximum volume while others, such as the bass drum or cymbals, might be annoyingly distorted at the same listening level. 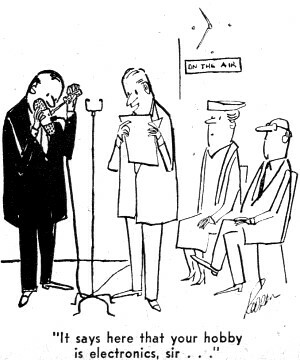 The important thing to remember when choosing an amplifier is that a high-fidelity system has to work properly as a whole, and that the loudspeaker, listening room, and personal listening preferences must be carefully considered before you can pin a number on the amount of watts required. The right amount of watts, however, can really "make" a hi-fi system.